To provide an easy and flexible way to setup a replication to SQL servers, we have replaced the Index Replication bundle with new mechanism that is a part of a SQL Replication bundle. To configure SQL Replication, we need to enable the SQL Replication Bundle and insert a SQL Replication Configuration document into our database. This can be done by using the Studio or manually by inserting proper document (Raven.Database.Bundles.SqlReplication.SqlReplicationConfig) under Raven/SqlReplication/Configuration/name_here key. 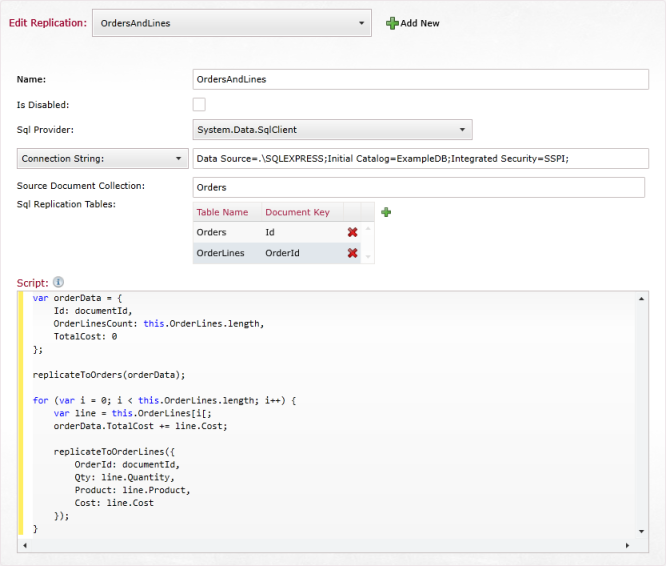 Let us consider a simple scenario, where we have an Order with OrderLines and we want to setup a replication to MSSQL. First we need to setup our MSSQL by creating a database with two tables. In our case the database will be called ExampleDB and the tables will be called Orders and OrderLines. Last step is to insert a document with our configuration. This can be done using Studio or manually. TableName = "Orders", DocumentKeyColumn = "Id"
TableName = "OrderLines", DocumentKeyColumn = "OrderId"
In Studio the configuration page is found under Settings -> SQL Replication. The script will be called once for each document in the source document collection, with this representing the document, and the document id available as documentId. Call replicateTo<TableName>() (e.g. replicateToOrders) for each row you want to write to the database.